Obituaries can paint a partial picture of a person–never assume they are complete. This 1926 item only mentions one un-named son and an un-named sister-in-law of the deceased. Interestingly enough, the notice does not mention the one daughter who lived in the town where the obituary was published while the son who was referenced lived elsewhere. Never assume the obituary or death notice is complete. 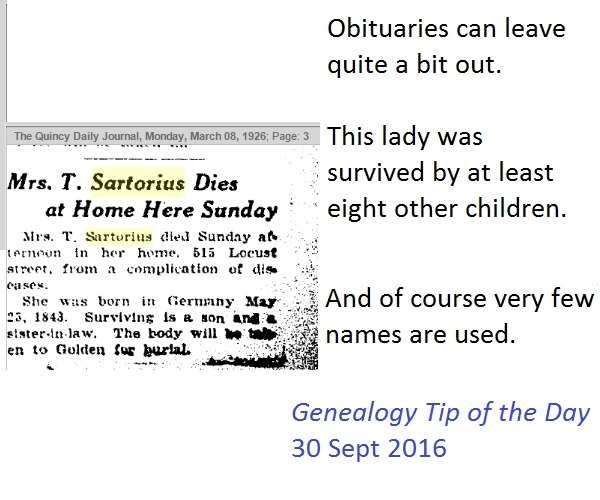 Genealogy Tip of the Day is sponsored by GenealogyBank.com–search for your ancestors today. This database has been on FamilySearch for some time, but is an index only. The National Archives houses the originals. 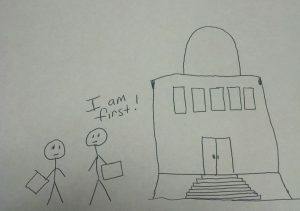 Records are recorded by local officials in the order in which they are brought to the courthouse. 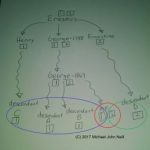 Generally speaking this is relatively close to when the even took place–people generally have vital events recorded quickly. The record where it is most likely to be a problem is with land deeds. For a variety of reasons, some deeds are not recorded promptly. People forget, things get temporarily lost, etc. Often the failure to record a deed is not realized until the purchaser dies and the family wants to sell the property and realizes the deed of purchase was never recorded. Consequently it is imperative to search deeds for sometime after the transaction took place. It is not unheard of for a deed from the 1840s to be recorded in the 1880s or even after. When reviewing materials in any case file (court record, military pension, homestead, etc. ), put the papers in chronological order of their execution–not their recording. Viewing the items in the order in which they were created will make it easier to analyze them and interpret them correctly. 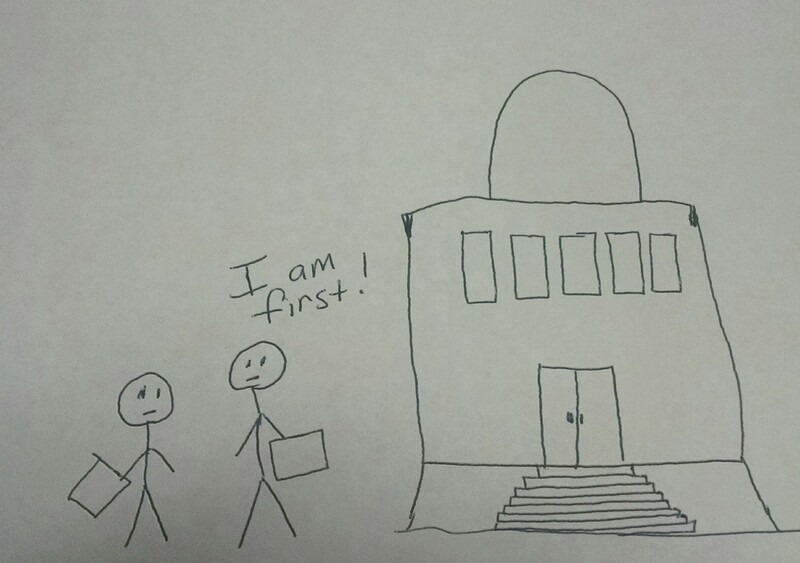 It is always important to understand the paperflow. Did They Actually Sign It? 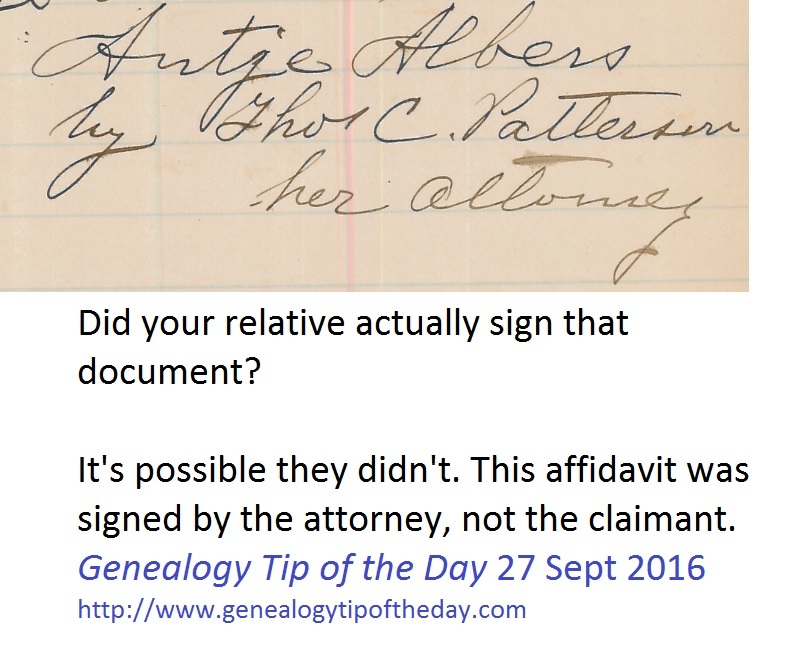 Record books that have copies of deeds, wills, and other records are not the only times you may encounter a document not actually signed by a relative. This 1880-era affidavit in a land claim from Nebraska contains the “signature” of the claimant, but it’s actually her lawyer writing the name. The word “by” is a big clue, combined with the consistent style of handwriting. I’m offering one last session of this class as I transition away from webinars and online presentations. Details are here. Do You Know What Sections Border What? If your relatives were farmers who owned their own land, do you know how the sections within a township are numbered? Knowing where your relative’s property fits in relationship to others can help you know how close they really live. 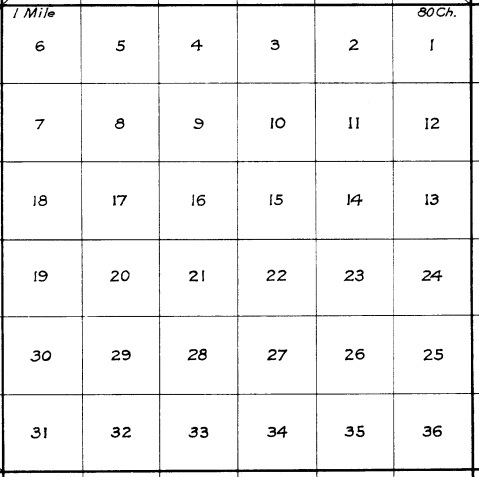 Not all bordering sections have adjacent numbers. The GLO Primer will give you a broad overview. 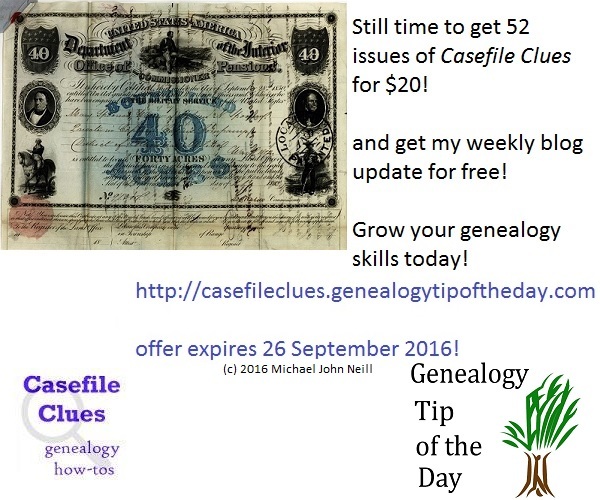 There is still time to get Casefile Clues at our old rate of $20 for 52 issues–that’s over 200 pages of genealogy how-to and instructional material written in a way that’s easy to follow and understand. We’ll also throw in a free subscription to my weekly blog update which summarizes postings from my four blogs along with a few extra features only found in the weekly update. Join us and discover more of your ancestors.